Labour has questioned the choice of a former Conservative health minister to be the next chair of NHS England. Lord Prior, a former Tory MP who served in government between 2015 and 2017, has been named preferred candidate to succeed Sir Malcolm Grant in the role. Paul Williams, a Labour member of the health committee, said he had "serious concerns" over the peer's independence and warned of "politicisation". But Health Secretary Matt Hancock said Lord Prior was "enormously qualified". In its role of running the NHS in England, the non-departmental body decides how the health service's annual budget of more than £120bn is spent and has day-to-day operational responsibility for the commissioning of services. Lord Prior's emergence as the government's chosen candidate to be its next chair, a decision signed off by Mr Hancock, comes less than a year after fellow Tory peer Baroness Harding was named as chair of NHS Improvement. Dr Williams said the two appointments constituted a "massive politicisation of the institutions intended to take politics out of the day-to-day running of the NHS". The MP for Stockton South, a former GP, told the BBC the health secretary appeared to be wanting to "recruit another politician to run the NHS for him". "Lord Prior has got experience, he has got expertise but he is a politician," he said. "He is a politician in what should be a non-political role." Lord Prior, the son of the late Tory cabinet minister Jim Prior, served as a junior minister in the health department under Mr Hancock's predecessor Jeremy Hunt. Before accepting a peerage in 2015, he was, as David Prior, Tory MP for North Norfolk between 1997 and 2001. He is currently chair of University College London Hospital NHS Trust, one of the largest in the country. During long career in public life, he has served as a former chair of the Care Quality Commission and the Norfolk and Norwich University NHS Foundation Trust. Dr Williams said the peer would face "tough questions" at a pre-appointment hearing of the cross-party health select committee next week. Although the committee does not have the power to block the appointment, the Labour MP said it should "show teeth" and he would have to be personally convinced that the peer would be able to put political interests aside when making future funding decisions. "He has not just held the Tory whip in the House of Lords," he said. "He has been a minister. It is going to be very hard for him to say no to Matt Hancock. "NHS England is supposed to be arms length of the Department of Health and political influence. He has to convince us that he will stand firm against political interference." Lord Prior, he added, should consider resigning the Tory whip for the duration of his chairmanship. Former Tory MP Lord Tyrie recently bowed to demands to sit as an independent after controversy over his appointment as chair of the Financial Conduct Authority. In a statement, Mr Hancock said he believed Lord Prior was the right man for the job and looked forward to working closely with him. 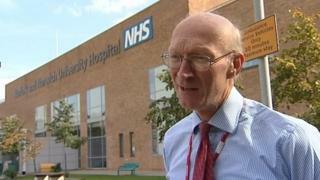 "Lord Prior brings huge experience to this important role where he will help deliver the long-term plan for the NHS. He is enormously qualified." The Tory peer would become only the second chair of the organisation, which began life as the NHS Commissioning Board Authority in 2011. Labour said the settlement did not make up for under-investment in the NHS over the past eight years and a lack of funds or planning for social care.